Boy it was tough deciding on which technique to do this month. I have three floating around in my head but this one won out. When you first learned to stamp, were you one who bought a roller? The kind with the different parts to go on it, such as a foam roller, a hard clear roller, and a hard foam roller? Might have looked like one of these? As you can see they not only come in different sizes, but some come with a pattern on the roller (the one on the right is a good example of that). And if you were like me, you now have a drawer full of different patterned rollers that you can change out as you wish. When was the last time you pulled that out of your drawer? Has it been years? Are you ready to drag it out and make cards with it once again? It’s about time! So this month our Technique Challenge is to make a card using your roller. You can use a patterned one if that’s what you have (just make sure there’s something Asian on your card). Have you forgotten how to use it? How to ink it up (if it didn’t come with it’s own little ink pad -that’s probably all dried out now). When you ink up your roller, remember to roll from top to bottom on your ink pad (or bottom to top) lifting your roller each time so it rolls all the way around to ink up the whole thing. Otherwise you’ll have an area that doesn’t have ink on it. And I was told when you start to roll on your paper, always start off your paper first. You can stamp your image in clear Versamark, dip it in clear embossing powder and heat set it so you have a nice clear raised image. 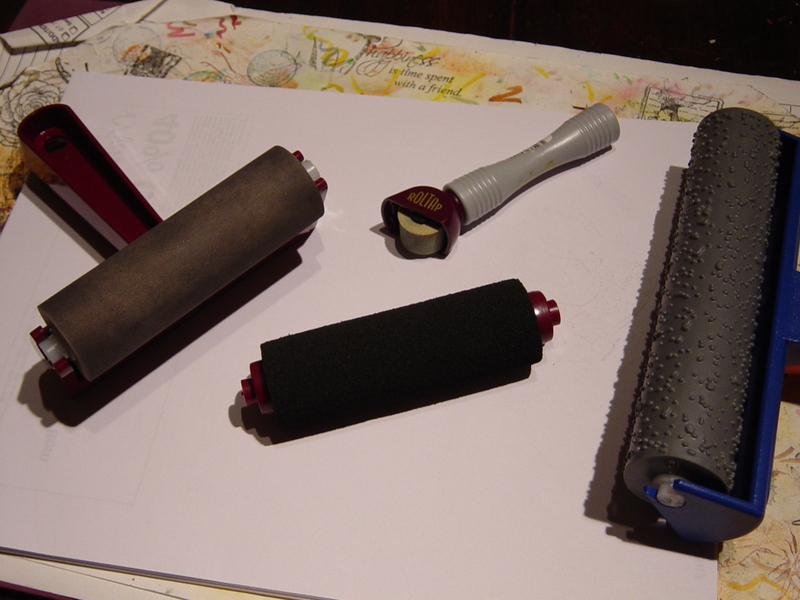 Then ink up your roller and roll over the paper. 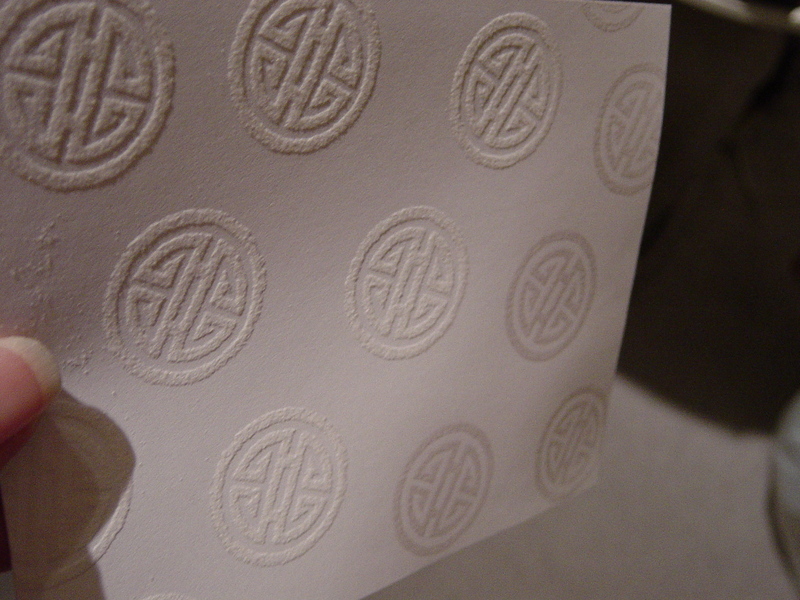 The part that was embossed stays the color of the paper you are working with. So, for example, if you have a beautiful red paper and you stamp in clear Versamark, emboss in clear embossing powder, and then roller in black, where your image is will remain red while the rest of your paper will be black. It really looks cool if you haven’t ever tried it. Inking with clear Versamark is a little tricky because you can’t always see where you’ve already stamped. 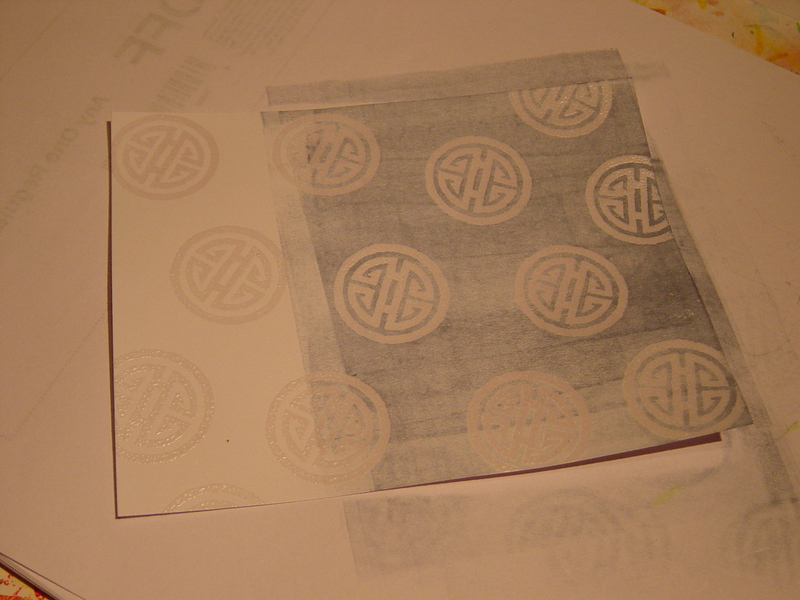 So I dip my paper in the clear embossing powder every so often so I can see where I’ve already stamped. Then when the page is done, I heat set it. Are you one who doesn’t know if you’ve heat set your embossing powder long enough? When using the clear, the images have a feathery look before embossing and after it’s nice and shiny without dimples in it and no feathery look. On this paper, I’ve embossed the circles on the far right. The ones on the left and middle haven’t been done yet. You can see the feathery look (plus if you look close to where my thumb is, you’ll see where there’s some embossing powder where there shouldn’t be – I brushed it off before I embossed that part). Had I used my talc bag to “destatic” the paper, that wouldn’t have happened – always great to have one of those or to make one. I’ve embossed the 4 lower coins on the right – see how they look flatter plus they are shiny and not puffy or feathery looking. Then here I rollered on a blue-gray on part of the paper to show you how it brings out the images you embossed. Once you are finished rollering the paper, just take a kleenix and wipe off the images and any ink sticking to it will come right off so they will be nice and clear. You can ink up using a rainbow pad to get different colors on your paper. Just make sure you always put the roller back on the ink pad in the exact same spot or you’ll bleed your colors. You can mask your paper and then roller areas for a different look. You can even put drops of your ink refills on an old CD to create your own color, roll your roller over it, and then roll it on your stamp for your own personal color. I saw this being done at a Rubber Stamp Convention and the results were outstanding. So, get out your rollers, decide on how you want to use it and make this month’s Technique Challenge. VSN Brayer Techniques For Stampers eArticle to help you in card-making.